While lettering trucks yesterday, I also lettered my Ambroid snow plow, using S scale boxcar decals from Al Ferguson at Black Cat Publishing. This morning, I weathered the plow and officially put it into service on the layout. Since I want the plow to look like it was recently repainted, I concentrated the weathering along the bottom edge of the blade and the wings, which would get dusty pretty quickly given how low to the roadbed they ride. 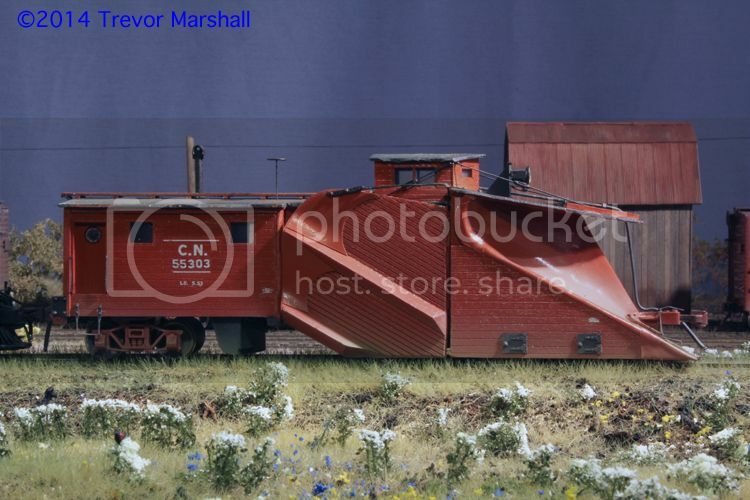 And since I model summer, my weathering palate included some green on the front of the plow blade: Regardless of what a plow is doing in Port Rowan in August, it has obviously rolled over a lot of tall weeds and grasses growing in the RoW on my branch. This was a really fun project and I enjoyed building this vintage Ambroid wood craftsman kit. While I have many other projects that take priority, I’m looking forward to doing more MoW equipment. 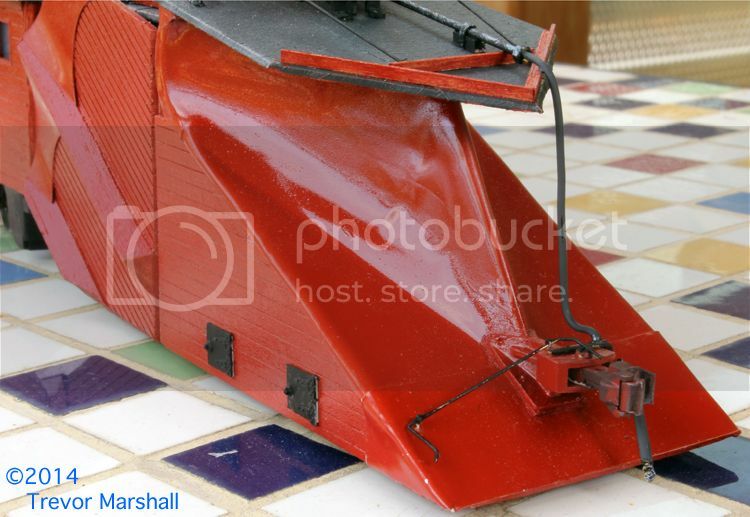 For example, at some point I’d like to scratch-build a Jordan spreader. In the meantime, I’ll enjoy including this plow in a work extra. Yesterday was pretty hot – it was the sort of day that made one want to sit under a ceiling fan and watch Apocalypse Now, just for the immersive experience. Instead, I sat near the air conditioner and tackled some lettering projects – including two CNR trucks. Lettering for Canadian trucks is hard to come by in any scale, I find – but it’s particularly difficult in 1:64. Fortunately, some HO scale lettering is available for the trucks I wanted to do so I cobbled together what I needed. They’re not prototypically accurate. But this is a compromise I can live with for now because the lettered trucks tell a better story to viewers than they did when unlettered. If someone does produce correct CNR truck lettering in S scale, I can always repaint – but I’m not holding my breath. The lettering for this truck includes CNR Express wafers from Al Ferguson at Black Cat Publishing. The “CANADIAN NATIONAL EXPRESS” lettering is from an HO scale passenger car set (300-006, produced by Microscale for the CNR Historial Association). The truck is parked next to the depot in St. Williams, ready to accept express off Mixed Train M233. This truck is lettered with decals for CNR 1959 Piggyback Trailers, produced by Down East Decals for the CNR Historical Association. It’s a big compromise for my truck, but this was the only set I could find with the CNR Maple Leaf and “CARTAGE” lettering. Since these decals can barely be seen on the finished truck (which is parked behind the Port Rowan station, and therefore about two feet from the front of the layout), I also added the “CANADIAN NATIONAL” billboard lettering to each side of the box. This helps viewers immediately identify the truck as being a CNR cartage vehicle – and therefore helps tell the story of the relationship between the trains and the CNR’s trucking operations. I gave each truck a light dose of weathering, and will add licence plates from Penitentiary Productions next time I’m doing a batch of cars and trucks. 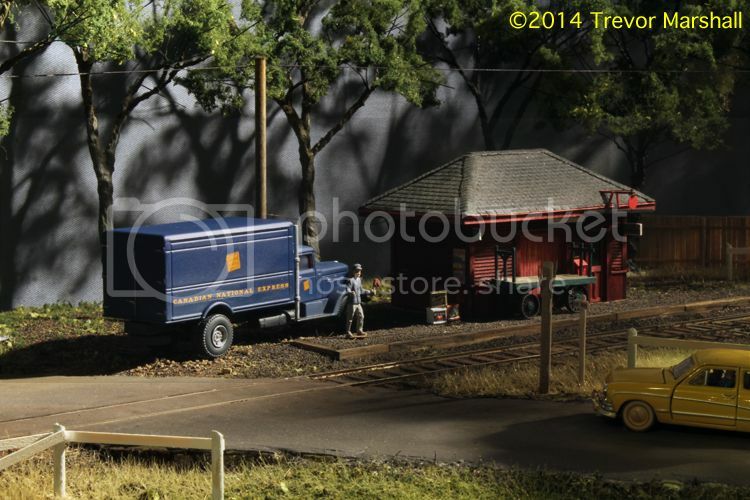 These trucks were nice, easy projects and I’m surprised at how much they enhance the scenes in which they’re placed. 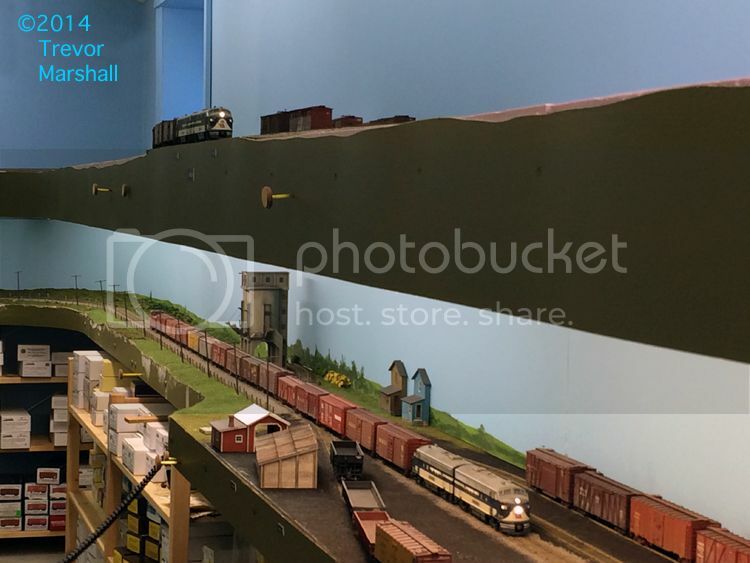 For me, one of the joys of reading the blogs of others is reading about how their model railways progress from a collection of raw materials into operating layouts. 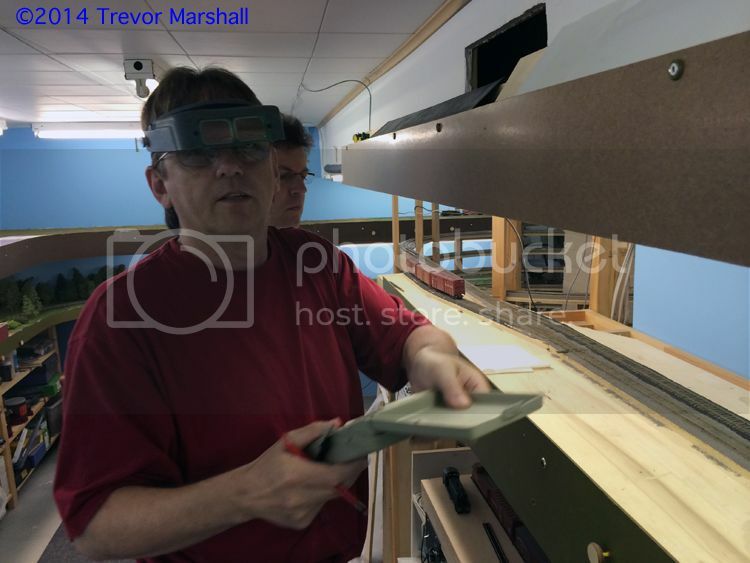 Unlike layout tours in magazines, where we often read about how a layout is supposed to operate, the early stage operating reports give us a real picture of what actually happens as the layout builder brings his/her vision to life. 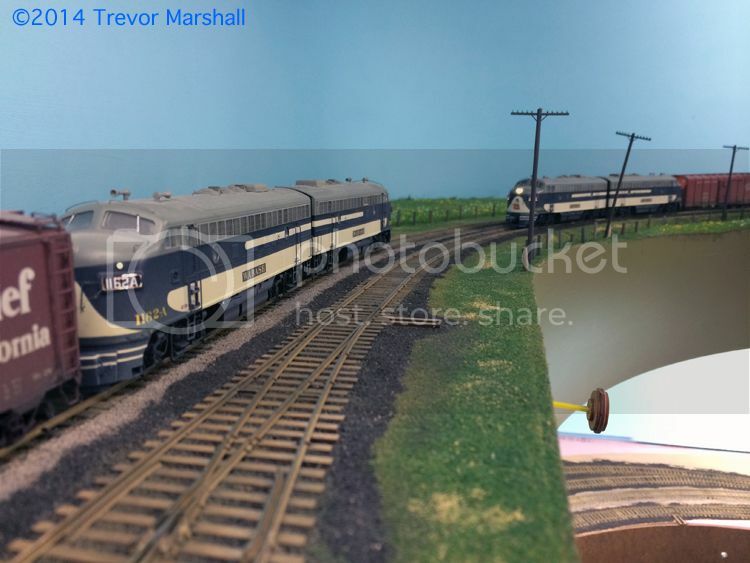 Marty McGuirk held the 5th operating session on his Central Vermont Railway on Saturday – his most successful session yet, he reports. Chris Adams held an ops session last Friday on his New Haven Railroad and has shared a couple of posts generated as a result of that – the first on handling Bad Order cars, the second on rebuilding an interlocking tower. Last Thursday, Eric Hansmann was putting his B&O Wheeling Freight Terminal through its first formal operating session. Early sessions are not always pretty – but the reports always informative and I gather some great ideas from reading them. Enjoy if you visit any of these links – and kudos to my online friends who have shared their stories for all of us! At 1:64, S is 36 per cent larger than HO – in each direction. For me, what this means is that S is an ideal scale for building models of smaller prototypes, such as the CNR Mogul at left. 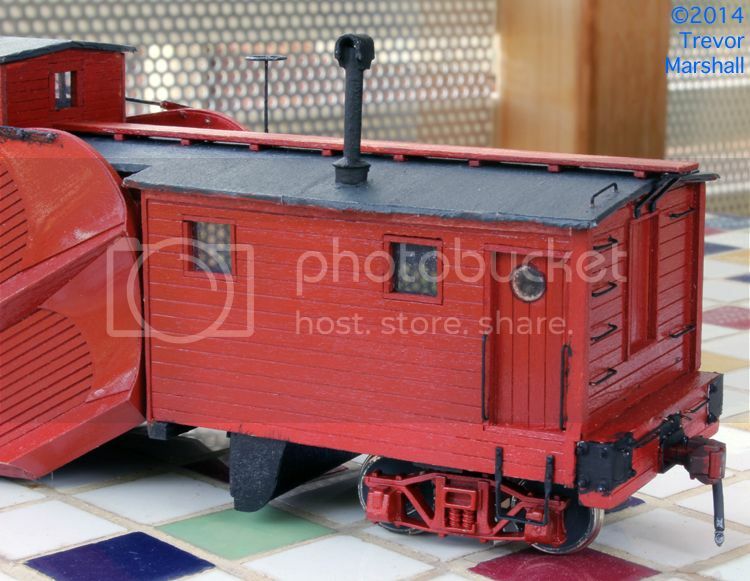 This S scale 2-6-0 is roughly one foot long – or about the same length as the HO scale New York Central 2-8-2 posed with it. From a model-building perspective, this means that the CNR 2-6-0 – which would be darned tiny in HO – is a decent size in S scale. 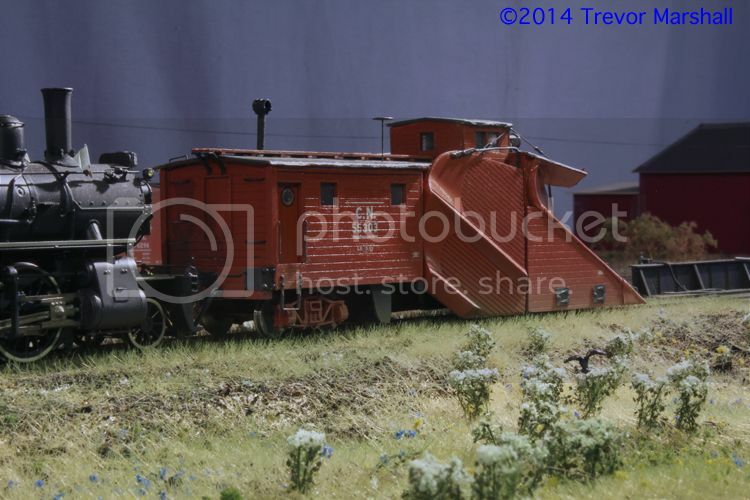 Many HO scale models of these small locomotives look great, but run terribly. But in S, there’s space in that boiler for a decent-sized motor, there’s room to thread wires to extra electrical pick-ups, there’s an opportunity to add a decent amount of weight, and so on. 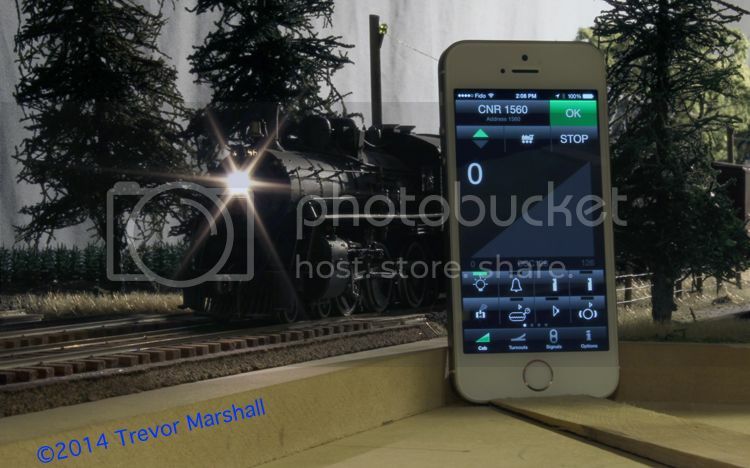 In fact, there’s arguably more space, because S scale models are taller and wider as the photo shows. The space advantage also applies to tiny details such as the lights and number boards – which are easier to illuminate in S simply because there’s more space for LEDs (or lamps) and wiring. 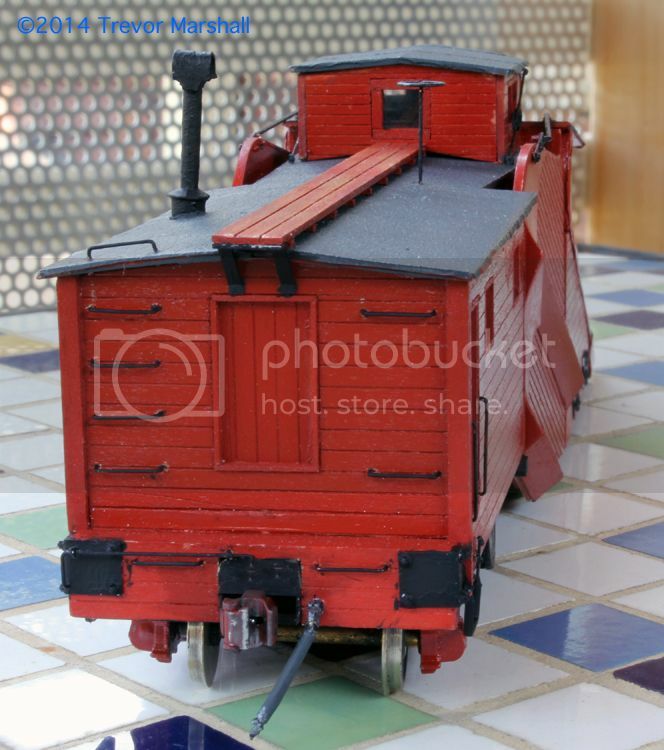 At the same time, this small S scale steamer requires roughly the same standards on a layout as a medium-sized HO steam locomotive. Turntables, storage tracks, tails for run-arounds, and so on – if an HO Mikado will fit, so will an S scale Mogul. The 2-6-0 will demand a larger minimum radius – in part because the equipment it pulls will also be larger, and will look better on broader curves. 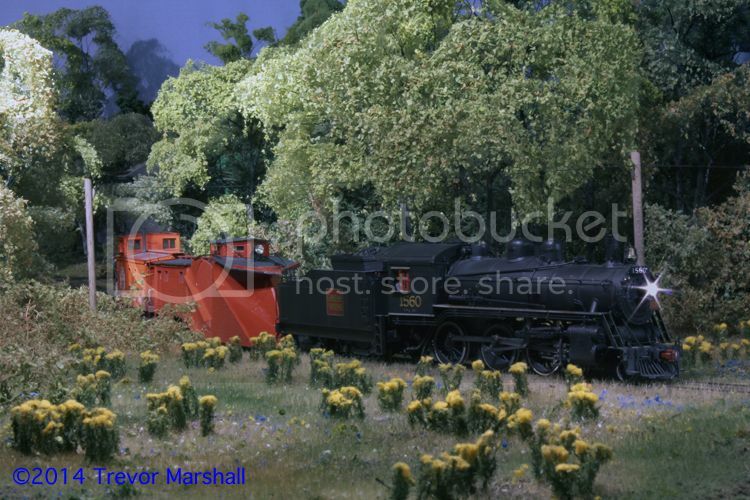 But it’s also likely to pull shorter trains than a 2-8-2, so the actual train lengths – and therefore the space taken up on the layout by staging, yard tracks, sidings and so on – may work out to about the same. Since I like small steam prototypes, S scale allows me to enjoy them while also enjoying the presence and performance benefits akin to well-detailed, well-tuned, medium-sized HO scale steam. The coupler cut lever is a piece of 0.015″ phosphor bronze wire bent to shape and mounted with a pair of Details Associates eyebolts. Also note that I’ve added some dark rust (Colour #302 from the Vallejo Panzer Aces paint line) to the couplers to tone down the primer colour I used to paint them. Following photographs, I’ve added access hatches to the side of the plow body to allow crews to oil/grease the front wheels. I cut some squares of 0.010″ styrene and glued them in place lined up with the journals on my arch bar truck. I added a strip of the same styrene next to the leading edge of the squares, so I could mount a pair of Tichy Train Group HO scale triangular hinges (part #3067). To represent a latch, I also added a NBW casting to the trailing edge of the squares. I don’t know the part number – they came from my miscellaneous NBW drawer. 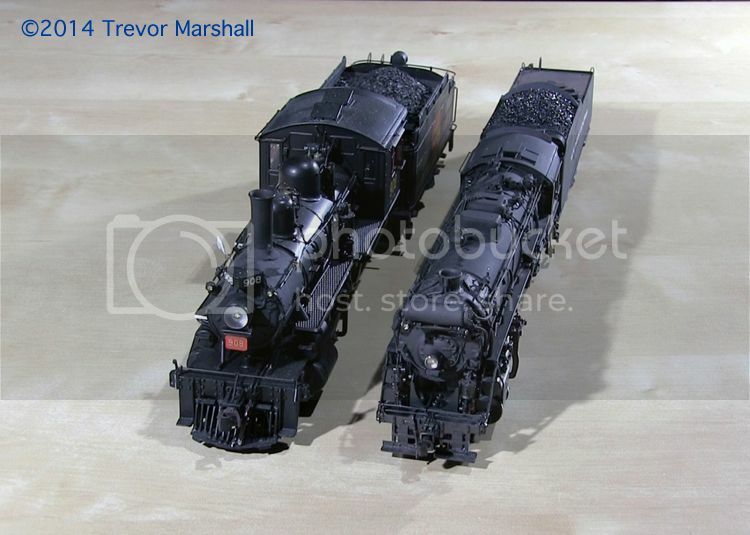 The stirrup steps have an interesting back-story: When I worked in On2, the Maine two-footer kits I built came with a number of O scale parts for three-foot gauge prototypes – simply because correct two-foot parts were not available back when these kits were manufactured. On3 stirrup steps were far too tall for two-foot equipment (which rode a lot closer to the ground) so I would scratch-build my own stirrups. I didn’t throw away all of the On3 details, though – and managed to find a pair of them that would be suitable for my S scale standard gauge snow plow. I compared them to the kit drawings and they worked just fine. I suspect these came from Grandt Line but I don’t know the part number. The drawings in the kit showed some metal corner pieces with large bolts through them, so I fabricated these using styrene strip. Rather than bend the strip, I cut pieces over-length and glued them to the sides of the end sill, then butted more pieces up to them at the back. I then trimmed the side pieces to length and used a file to round the corner. I cut and bent the various hand grabs and the cut lever from 0.015″ phosphor bronze wire, using a Mission Models Grab-Handler to get consistently-sized grabs. I used some styrene strip to fabricate the support for the end of the roof walk. That’s it for detailing! 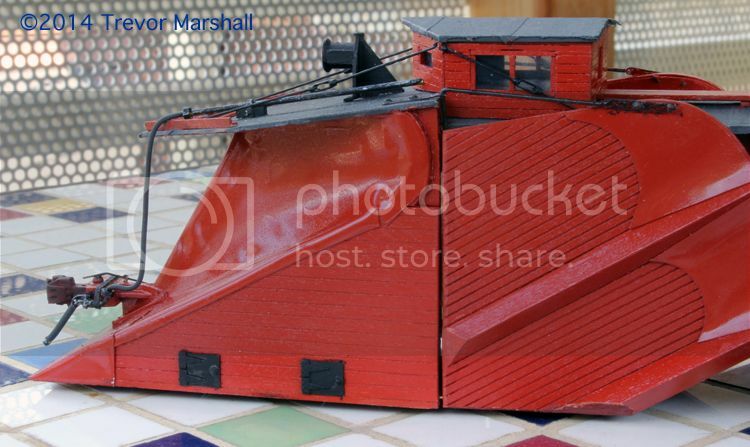 Next up, I will letter the plow using some CNR boxcar decals from Black Cat Publishing, then do a (fairly light) weathering application to represent a plow that’s been recently shopped and prepped for the coming winter. I had a great time yesterday – socializing and running trains at Pierre Oliver‘s place as a busy layout operating week continued. 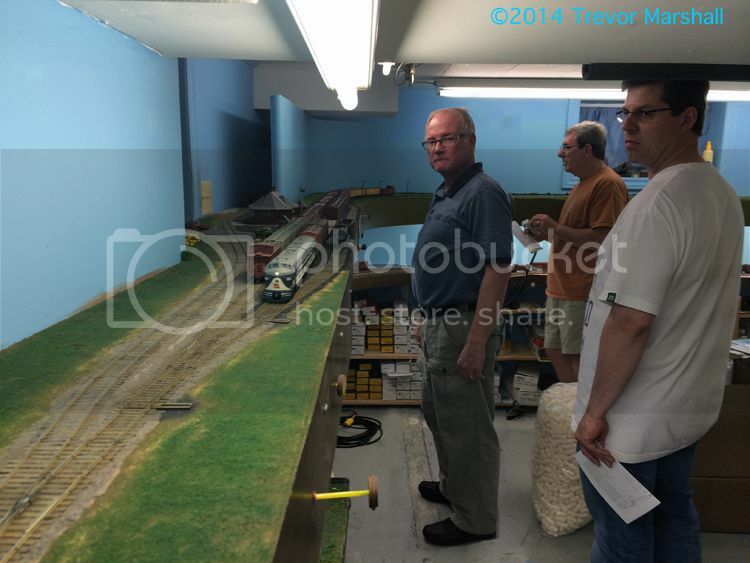 Following last Sunday’s ops session in which Pierre, Thorsten Petschallies and Chris Abbott descended on the Port Rowan branch, I joined Thorsten, Mark Hill and Don Janes at Pierre’s place to put Pierre’s HO scale Wabash Railroad Buffalo Division through its paces. Pierre’s layout is operated via time table and train order and it requires a crew of four or five to move all the trains, so this is just the second full operating session we’ve held (and the first for Thorsten, Don and Mark). Fortunately, it’s not a jam-packed schedule – not yet – so there’s plenty of time to sit and socialize between assignments. As Pierre’s regular operating crew becomes more comfortable with the operating scheme and we shake the gremlins out of the system (there are always gremlins when a layout first goes from “building” to “running”) there’s plenty of opportunity to add more trains in the form of extra freights and advance sections for the scheduled (third class) Red Ball freights. I had a great time. It was fun to catch up with Mark and Don, and expose Thorsten (who is a friend of ours from Germany) to another example of southern Ontario prototype railroading. Pierre made some notes and I know I’m going to be doing some more work on his time table in the days ahead. But I’m already looking forward to the next operating session. Well done, Pierre – and thanks for having us over! My friend and neighbour David Woodhead was interested in a couple of things I’ve written about recently on this blog and elsewhere, and he wanted to experience them first-hand. So yesterday I put on a big pot of coffee and he dropped in for a visit. First, David wanted to know more about TouchCab – an app that interfaces with the Lenz DCC system to let one use an iPhone or iPod Touch as a wireless throttle. I’ve written about this before on this blog, but David – who also uses Lenz DCC – hadn’t had a chance to try out the system. I was really pleased David’s interested in this, as I tend to not use the system as much as I thought I would when I first installed it. There’s nothing wrong with the system – but I also have Lenz wired throttles and they’ve always done a fine job for me so I tend to reach for those first. So, David’s visit was a great opportunity to get reacquainted with TouchCab. And I’m going to have to use it more often. I was pleasantly surprised at how intuitive the interface is and I was able to use it with confidence in almost no time, and with no need to refer to manuals. I will need to keep this in mind for future operating sessions. It’ll be nice to cut the cord. The second thing David wanted to know more about was my experiments with Sergent couplers. 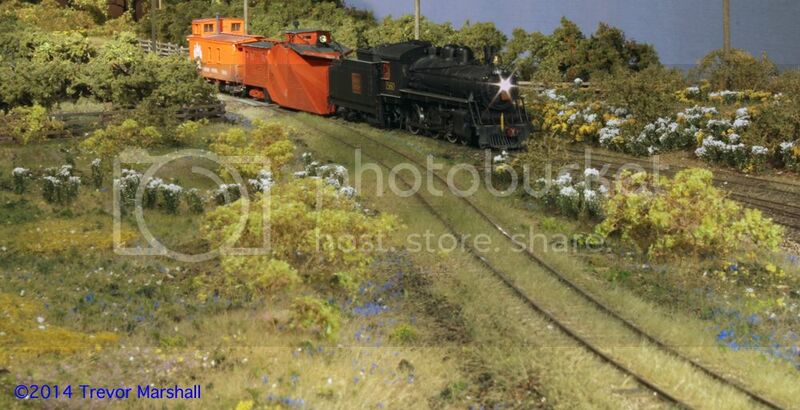 We ran a train (the one seen in the above photo), and switched a fair number of cars in Port Rowan. 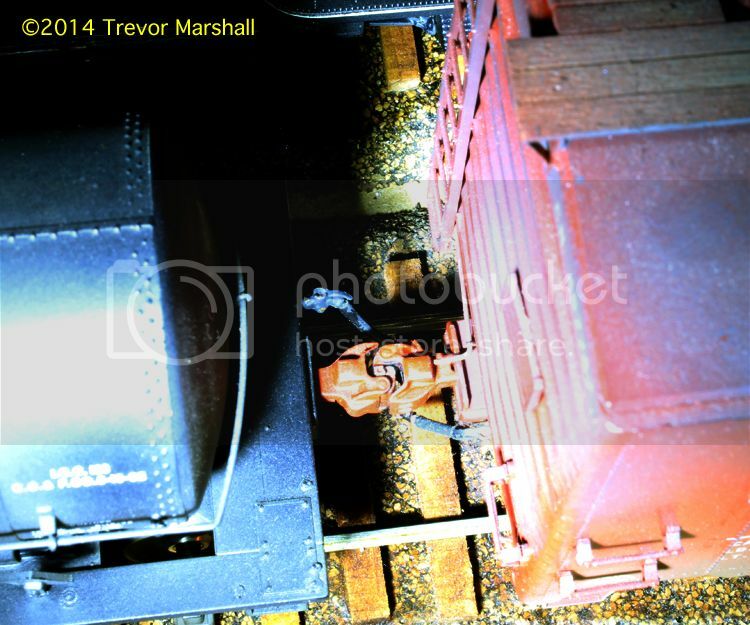 The work included swapping two cars on the elevated coal track, which is the least accessible track on the layout. The Sergent couplers worked fine. We had a few issues that were related to human error – namely, not checking that knuckles were open before trying to couple up. Those will resolve themselves as I become more comfortable with the couplers. A train of a half dozen cars has about as much slack as two cars with Kadees – and that’s after modifying the Kadee couplers to remove slack action in the draft gear. Finally, I took advantage of having a second set of eyes around to investigate why one of my passenger cars was derailing near the west siding switch at St. Williams. David and I determined that it was a tight gauge problem near the headlocks, which was forcing the troublesome bogie to ride up and over the rail. After David left, I grabbed the track-working tools and made some adjustments. I appear to have solved the problem – further tests will tell. Thanks for dropping in, David – it was great to see you as always, and the layout is better for it too! On Sunday, I hosted an operating session for a few friends – including one who crossed an ocean to take part. Okay, Thorsten Petschallies was in southern Ontario from Germany for several reasons – but getting together with Pierre Oliver, Chris Abbott and myself was on the list. I met Thorsten through Pierre a few years ago, and it’s always great to see him. The first trip out, Chris put on the conductor’s hat for mixed train M233 / M238, while Thorsten took the engineer’s seat and I handled the Sergent couplers. I loaded up the mixed with LCL and Express so we did all the paperwork and switching involved with those items in addition to handling carload freight. For the second run, we switched a Kadee-equipped freight extra, with Thorsten as conductor and Pierre at the throttle. 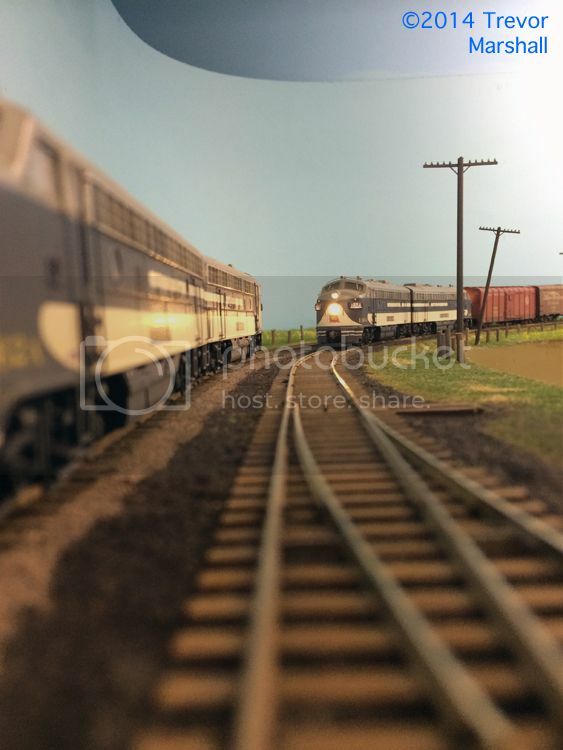 Everybody had a good time and the layout ran very well, although I had a couple of minor derailments. I made a note of the equipment involved and the location where the derailments occurred, and will investigate further. We were all pleasantly surprised that the Sergent couplers performed better than the Kadees during Sunday’s operating session. 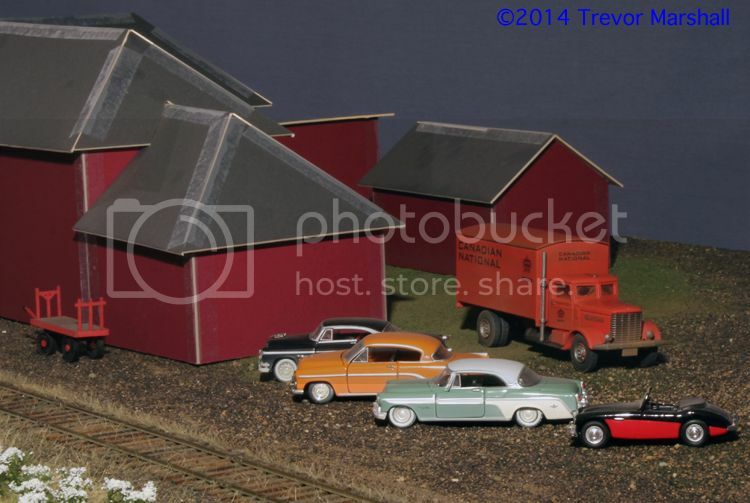 We even switched a couple of cars onto the elevated coal delivery track in Port Rowan – the least accessible spur on the layout – and the Sergent couplers performed flawlessly there. I did find a couple of sticky couplers, which I cleared up this morning by adding some graphite and working the knuckles a bit more to polish the moving surfaces. So far, so good. Thanks for visiting, guys – I’m looking forward to the next time! Fellow S scale enthusiast Peter Vanvliet maintains an interesting blog about his layout and – like me – he is experimenting with the new EC64K S scale coupler kits from Sergent Engineering. I picked up some useful ideas from reading his report – I hope you do too. 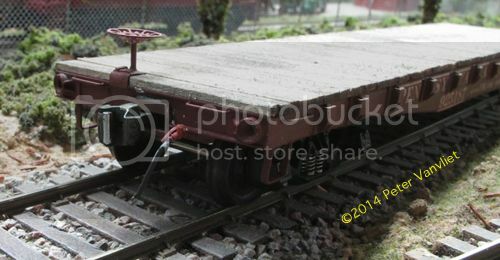 Click on the picture, below, of one of Peter’s scratch-built Pennsylvania RR flat cars equipped with a Sergent coupler to read more about his experience with the EC64 – and enjoy if you visit. How are you going to justify having a plow on the layout in August? That’s an excellent question, Craig – thanks for asking – and it deserves a better answer than, “See Rule 1″*. In fact, there are two possible answers. The plow may spend most of its time slumbering in my excess stock storage drawers during regular operating sessions with visitors. The second possible answer is that while I’ve picked a season to represent on the layout, I may adjust the operating patterns to match the season in the real world. In the summer, an extra passenger car may be added to the mixed to handle vacationers headed to Long Point. 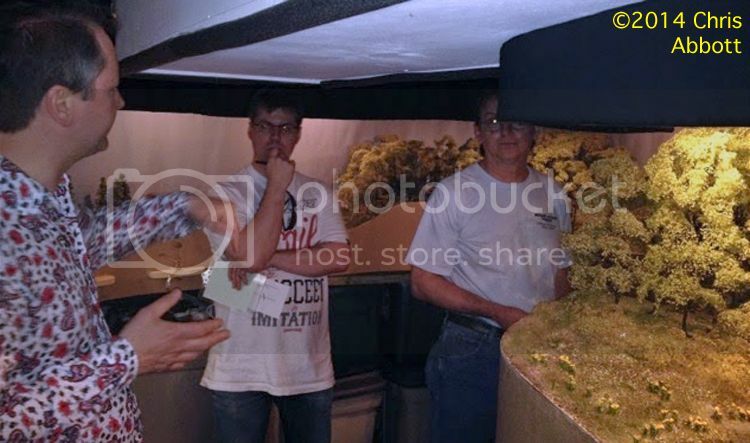 In the fall, I’d run an extra train collecting reefers full of produce. Under this scenario, running a work extra in late fall and early spring to position the plow in case of storms and retrieve it at the end of the season makes sense. It can rest at the end of the team track over the winter, ready to go into service should the need arise. I haven’t decided whether I’ll run a seasonal schedule. I will have to determine whether it’s warranted and what changes I could make to the operating sessions to represent such seasonal activity. But it’s one way to add some variety to the operating sessions.